The Forest Service at Land Between the Lakes National Recreation Area in western Kentucky has proposed commercial timber harvests on approximately 120 acres in response to a tornado that impacted the area on July 6, 2016. Most of the harvests proposed in the Birmingham Ferry Salvage Project are on the north end in the Birmingham Ferry/Pisgah Bay area near Kentucky Lake and the Cravens Bay area near Lake Barkley. There are several problems with this proposal, and we encourage the public to submit comments in opposition. The Forest Service will also be hosting a field trip in the area on Friday September 16, 2016 at 9:00 am, and meeting at the Birmingham Ferry Backcountry Area parking lot. We encourage people to attend. ​Comments on the Birmingham Ferry Salvage Project are due by Friday, September 30, 2016. How to comment and more info here. ​Our initial victories at LBL with the withdrawal of the Pisgah Bay Project, including 3,600 acres of logging, and securing a temporary moratorium on new logging projects, were momentous but temporary. The Forest Service has acknowledged that management proposals and public outreach need to be approached differently. Now the multiple-use agency is trying to figure out how to propose and implement land management actions, including logging, without being met by the near-rebellion that marked much of 2015. In spring of 2016, the Forest Service initiated informal discussions of a “test area” called Fox Hollow for input into a possible future management proposal. This August they issued a scoping notice with little detail proposing management, including limited logging, in the Fox Hollow area. A week later the Forest Service released for comment a salvage logging proposal in response to recent tornado. While the cumulative acreage of these two projects is relatively small (in the 100’s of acres), they represent the next phase in determining how management will proceed at LBL. We are working closely with our allies in the Coalition for the Preservation of Land Between the Lakes, including county leaders, several recreation groups, and former residents, to develop a unified response to these proposals. ​After more than a year of hard work, Kentucky Heartwood and our allies with the Coalition to Preserve Land Between the Lakes succeeded in convincing the Forest Service to withdraw the Pisgah Bay Project and more than 4,000 acres of commercial logging! Learn more about the proposed Pisgah Bay Project here. 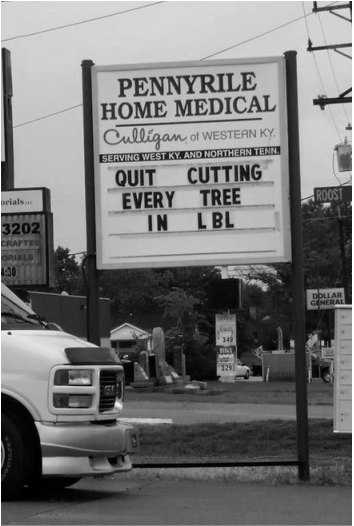 The LBL Draft Scenery Management Plan was withdrawn! To stay informed and get involved, visit Coalition for the Preservation of Land Between the Lakes.